Having finally recovered from the accumulated sleep debt, the mighty Black Fish wish to take this opportunity to congratulate Cadel Evans on his Black Fish-worthy victory in the 2011 Tour de France. Last minute contract negotiations between BF management and BMC are ongoing, but we remain hopeful that a transfer deal will be in place in time for Cadel to line up for the Fish in the 2012 TdU. The main obstacle at this stage remains Cadel's reluctance to undergo the indescribable pain of weekly sufferfest sessions at Dicky's House o' Pain in the months prior to the event. For only the very hardest of characters can endure that degree of pain. In return for his attendance, current BF cycling team members have agreed to spend the next few months growing arse-chins. 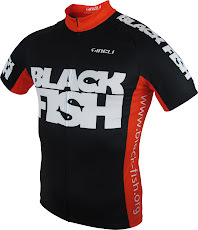 And in even more exciting news, when Cadel dons the BF strip in January (if he hardens up a bit), he will be wearing the new (official) Black Fish cycling gear. Stay tuned for more information on how you too can soon be the proud owner of official Black Fish merchandise.